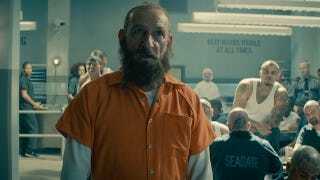 Trevor Slattery (played by Ben Kinsgley) is still one of the best creations from the Marvel movies. And the latest new clip from this upcoming Mandarin short film makes our heart yearn for more Trevor! He's just so good. The new short "All Hail The King" shows what life is like behind bars for The Mandarin. It's just so delightful to have this character back (really in any form) and we beg Marvel please, please, please consider giving this character a revival in Phase 3 or something. Just don't lock this gem away forever. Ultron Vs. Trevor! "All Hail the King" is the next Marvel one-shot, included on the DVD/Blu-ray release of Thor: The Dark World.